WELCOME to the Toowoomba and Darling Downs Family History Society Inc.
Do you have a story about someone/a family buried in the Toowoomba and Drayton Cemetery? We are now looking for submissions for the 4th volume in our series on those who are buried in “our backyard” . If you are interested in having that story included in the next volume contact our Secretary for details of submissions. Contact Details at the foot of the page. 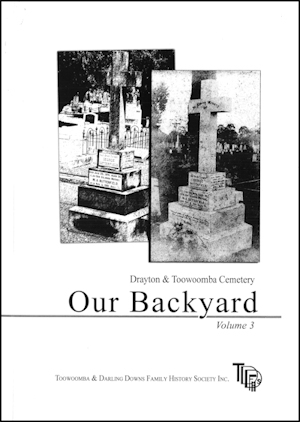 We still have for sale the third volume of contributed stories of people buried in the Drayton and Toowoomba Cemetery. This volume like those published before contains the interesting background information of a mix of well known and little known identities.The book contains 266 pages including an index.Over ninety family groups are mentioned. It is fully illustrated. It is available now from the Society during office hours or can be ordered and mailed to your address by contacting our secretary. 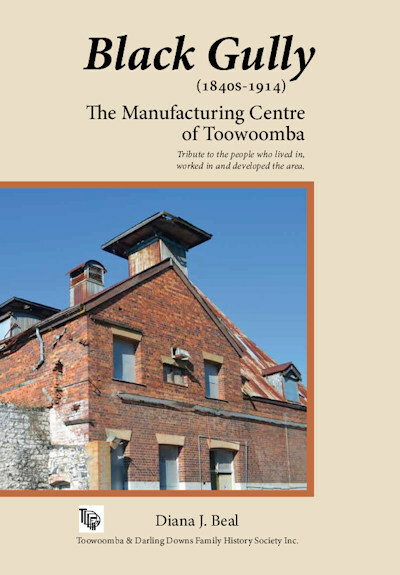 This history of Black Gully is of an area of Toowooomba whose past has been largely forgotten - A past as a farming, industrial and residential area, which has been substantially lost as it is no longer recognised as a proper address. The book is now available for sale at the society for $15.00 or for $20.00 posted which includes postage and packaging. STOP PRESS - This is now available on CD as a .pdf file at a cost of $15 which includes postage. The Toowoomba & Darling Downs Family History Society will guide you through the basic steps of researching your family history. Details of past generations can be gleaned from the many records held in the Society’s library. These records are found on all forms of media – books, fiche, microfilm and computers. The Society is well known for its many indexing projects. We understand that many people are now used to searching on the internet and want quick answers. We are a progressive society and many records of family can be found in our master indexes and newspaper index. As well we have many records such as Government and Police Gazettes, later Electoral Rolls for all states easily searchable by computer. There is always a Duty Member available to assist at the family history centre to give advice on where you might find that elusive piece of information. Duty Members will also show you how to use equipment that will aid in your research. Don’t forget to check the computer master indexes as they may save you valuable research time. The master indexes include a general index, cemetery index, newspaper index and school pupils index.